I'm gonna pull the trigger on a rug for the dining room...As soon as I decide which one to get! Maybe talking it though will help. Here are my six favorite rug options, all are priced between $150 and $650. OK, let's take a look at some dining room eye candy and discuss. Gosh this room from The Interior Collective is lovely. The pastel colored shell chairs with the rustic table, landscape paintings and black fireplace...It's perfect in my book. However, note the absence of a rug, which I don't think would be right for our space. 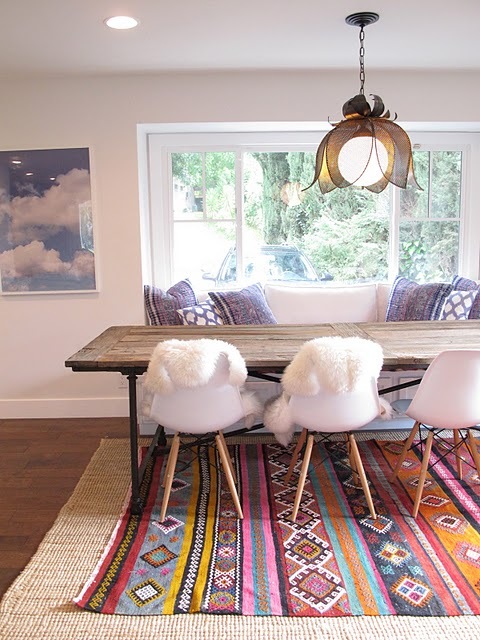 Kilim rugs are popping up everywhere and I love the vibrant colors and geometric patterns. Rug number three is beautiful and I think it would look great, but I can't justify the price tag. There are a handful of things in life that I believe are worth investing in; high quality sheets, well fitting jeans and good vodka to name a few. A rug I might not like in a year? Meh. 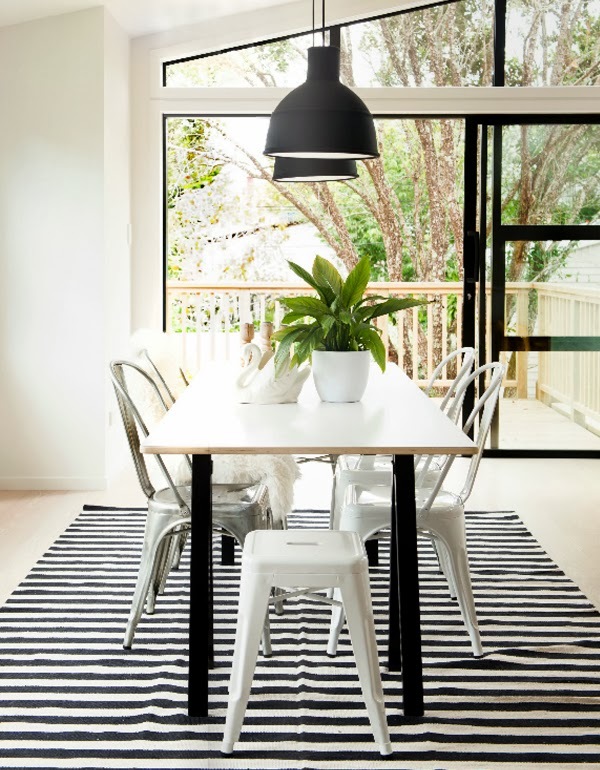 I'm loving black and white striped rugs and basically anything black and white. Although I love the Aztec-ish design of rug number five, I'm worried I won't like it in a year. As for number six, I don't know...Are those stripes too 'jailhouse jumpsuit'? I have it narrowed down, but I still might need to flip a coin! Which one do you like? Here's what the dining area looks like currently. And can I just say...Scandinavia .That's where it's at. Seriously, those folks have chic living figured out. I just started following a blog from Sweden called AprillAprill. Have you heard of it?